Acton, Mary. Learning to Look at Sculpture. London: Routledge, 2014. Brüderlin, Markus, Hartmut Böhme, and Amy J Klement. Art & Textiles: Fabric As Material and Concept in Modern Art from Klimt to the Present. 2013, fig. 17, color illus, p. 25, fig. 3, p. 310. Roberts, Brady M., Chuck Close, and Tara Donovan. Currents 35: Tara Donovan. 2012, p. 13, fig. 2, color illus. Böhme, Hartmut. Art & Textile: Fabric As Material and Concept in Modern Art from Klimt to the Present. 2013, fig. 17, color illus., p.25, fig. 3, p.310. Foundation Beyeler, ed. Action Painting. 2008. Basel, Switzerland: Foundation Beyeler. Adamson, Glenn. Thinking Through Craft. Oxford and New York, Berg Publishers in association with Victoria and Albert Museum, 2007, pp. 63–64, fig. 2.9. Drouin-Brisebois, Josee. Deconstruction. Ottawa: National Gallery of Canada, 2007, b/w pl. p. 9. Varnedoe, Kirk. Pictures of Nothing: Abstract Art Since Pollock. Washington, DC: National Gallery of Art; Princeton, New Jersey: Princeton University Press, 2006, color illus. p. 187, fig. 4.37. Sussman, Elisabeth and Fred Wasserman. Eva Hesse: Sculpture. New York: Jewish Museum; New Haven and London: Yale University Press, 2006, color illus. pp. 28, 30–31, and 39, b/w illus. pp. 30 and 44. Binstock, Jonathan. Sam Gilliam: A Retrospective. Washington, DC: Corcoran Gallery of Art; Berkeley: University of California Press, 2006, b/w illus. p. 63. Andera, Margaret, Nonie Gadsden, Britt Salvesen, and Laurie Winters. Collection Guide: Milwaukee Art Museum. Milwaukee, Wisconsin: Milwaukee Art Museum, 2004, pp. 42, 70, cat. 66, color illus. p. 42. Baker, Kenneth. Eva Hesse. Modern Painters 15, no. 1 (Spring 2002): color illus. no. 116–17. Sussman, Elisabeth. Eva Hesse. San Francisco: San Francisco Museum of Modern Art, 2002, b/w illus. no. 270–71 and 275. Milwaukee Art Museum. Building a Masterpiece: Milwaukee Art Museum. New York: Hudson Hill Press, 2001, p. 163, color illus. Potts, Alex. The Sculptural Imagination: Figurative, Modernist, Minimalist. New Haven and London: Yale University Press, 2000, b/w illus. no. 354–355. Krajewski, Sara. Leonardo Drew. Madison, Wisconsin: Madison Art Center, 1999, b/w illus. p. 21. Ades, Dawn, Neil Cox, and David Hopkins. Marcel Duchamp. London: Thames and Hudson, 1999, p. 209, b/w pl. 162. Lee, Pamela M., and Christine Mehring. Drawing Is Another Kind of Language: Recent American Drawings from a New York Private Collection. Cambridge, Massachusetts: Harvard University Art Museums, 1997, b/w illus. p. 64. Archer, Michael, Guy Brett, and Catherine de Zegher. Mona Hatoum. London: Phaidon Press Limited, 1997, b/w illus. p. 102. Rugoff, Ralph. Scene of the Crime. Los Angeles: UCLA Armand Hammer Museum of Art and Cultural Center; Cambridge, Massachusetts: MIT Press, 1997, b/w illus. p. 35, fig. 17. Ziesche, Angela. Das Schwere und das Leichte: Kunstlerinnen des 20 Jahrhunders; Skulpturen, Objekte, Installatione. Cologne: DuMont, 1995, color illus. p. 65. Krauss, Rosalind E. The Optical Unconscious. Cambridge, Massachusetts and London, England: An October Book, MIT Press, 1993, pp. 318 and 344, b/w illus. p. 318. David, Catherine, and Corinne Diserens. Eva Hesse. Valencia: IVAM Centre Julio Gonzalez, 1993, pp. 13 and 188, b/w illus. p. 15. Kurtz, Bruce. Contemporary Art 1965–1990. Englewood Cliffs, New Jersey: Prentice Hall Inc., 1992, p. 124, b/w illus. p. 123.
Cooper, Helen A. Eva Hesse: A Retrospective. New Haven, Connecticut: Yale University Press, 1992, color illus. p. 238. Barrette, Bill. Eva Hesse Sculpture. New York: Timken Publishers, Inc., 1989, p. 222, illus. p. 223. Goldstein, Rosalie, ed. Guide to the Permanent Collection. Milwaukee, Wisconsin: Milwaukee Art Museum, 1986, p. 231, b/w illus. p. 231. Johnson, Ellen H. Modern Art and the Object. London: Thames and Hudson, 1976, pl. 41. Lippard, Lucy. Eva Hesse. New York: New York University Press, 1976, pp. 162–63, fig. 268, no. 98, p. 232. Wilmerding, John. American Art: The Pelican History of Art. New York: Penguin Books, 1976, p. 235, pl. 297. Art News (February 1973): illus. p. 73. Van der Marck, Jan. American Art: Third Quarter Century. Seattle, Washington: Seattle Art Museum, 1973, p. 93, cat. 24, illus. p. 92. Solomon R. Guggenheim Foundation. Eva Hesse: A Memorial Exhibition, New York: Solomon R. Guggenheim Foundation, 1972, cat. 43, illus. An Interview with Eva Hesse. Artforum (May 1970): 63, illus. p. 63. Atkinson, Tracy. A Plastic Presence. Milwaukee, Wisconsin: Milwaukee Art Center; New York: Jewish Museum; San Francisco: San Francisco Museum of Art, 1969, repro. p. 45. Garrett, Craig, Suzanne Perling Hudson, and Terry Winters. Terry Winters - Patterns in a Chromatic Field: [... to Accompany an Exhibition at the Matthew Marks Gallery, Los Angeles, from April 19 to June 23, 2014]. New York, NY: Matthew Marks Gallery, 2014, p. 10, color illus. 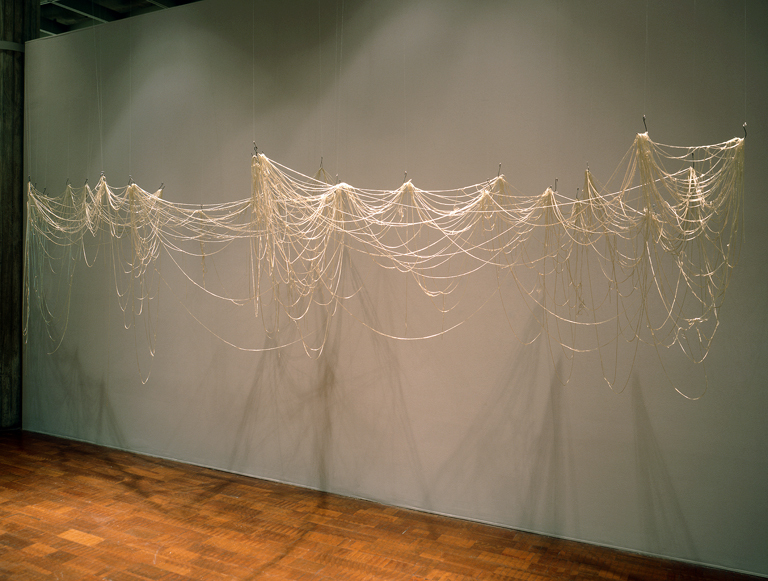 Eva Hesse: A Retrospective, Yale University Art Gallery, April 22, 1992–August 2, 1992; Hirshorn Museum, Washington DC, October 13, 1992–January 10, 1993. A Plastic Presence, Milwaukee Art Center, January 30–March 8, 1976; The Jewish Museum, New York; San Francisco Museum of Art. American Art: Third Quarter Century, Seattle Art Museum, August 22–October 14, 1973.